Please install the driver first, then insert the usb wifi adapter. 2. Open the "setup.exe" in CD, and install the driver. 4. If you have any questions or problem when using, please feel free to contact us. you can contact us by Amazon message and we will immediately to solve the problem for you within 24 hours. Sincerely at Your Service. - With AC600 wireless wifi adapter, you can shift between 2.4GHz and 5GHz wifi bands to avoid interference and have optimal wifi internet connection for your PC, laptop or Mac. - You can use the more clear 5GHz WiFi band for on-line streaming of HD video, gaming, music, photo; and use 2.4GHz band for web surfing, online chatting. - 2dBi detachable omni-directional antenna provides high performance and increased coverage for your wireless network. - Comes in a high pressure plastic packaging that doesn't break apart. Higher-transmission Speed：Upgrades PCs to 802.11ac, the latest & most powerful Wi-Fi technology - 3 times faster than wireless N speeds. Enjoy smooth online gaming and seamless HD video streaming. High-performance Antenna: 360°omnidirectional high gain antenna guarantees high RF power (16DBm on 2.4GHz & 13DBm on 5GHz), allowing you to pick up wireless signals from long distance. Flexible antenna and Beamforming+ technology help boost speed, range and reliability. 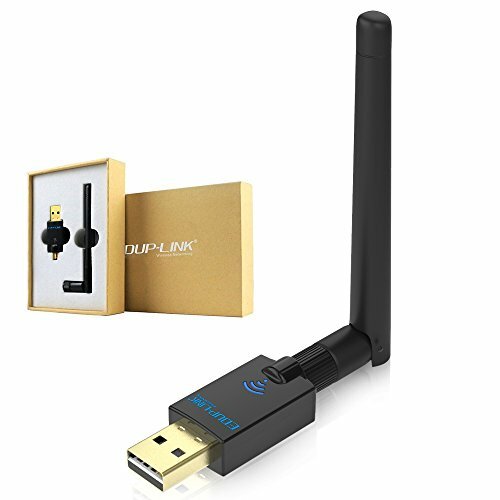 Perfect after-service AC600Mbps wireless wifi dongle offer 2 year warranty and 24/7 technical support. Any problems on setup, please CONTACT US via emails or Q&A. If you have any questions about this product by EDUPLINK, contact us by completing and submitting the form below. If you are looking for a specif part number, please include it with your message.